The flower of the Bird of Paradise (Strelitzia reginae) looks like a brightly colored bird in flight. Bird of Paradise (Strelitzia reginae) is native to South Africa. Its unique flower, resembling a brightly colored bird in flight, is the source of the common name. Due to the shape of its leaves, it was once classified in the banana family, but now has its own, Strelitziaceae. The plant will grow to a height and width of about five feet. It has a trunkless, clump-forming pattern of growth. 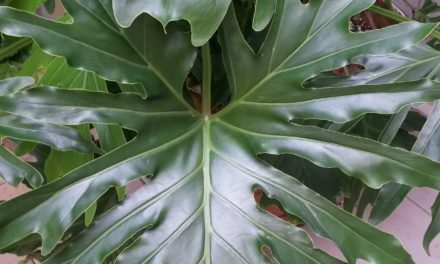 The thick, stiff, concave leaves grow to about six inches wide and 18 inches long. They are attached to a long stalk that sometimes reaches five feet in length. Bird of Paradise prefers full sun but will tolerate lower light levels, such as that received from a south facing window. They prefer 65 to 70 °F during the day and 50 to 55 °F at night. They prefer moderate relative humidity, around 60 percent, which may require daily misting during the dry winter months. If placed outside in the summer, bring them indoors when temperatures begin to drop below 60 °F. Bird of Paradise should be watered and fertilized according to growing conditions. When watering, thoroughly wet the potting mix, then allow it to dry slightly before watering again. Watering will be less frequent during the colder months when light levels are reduced. 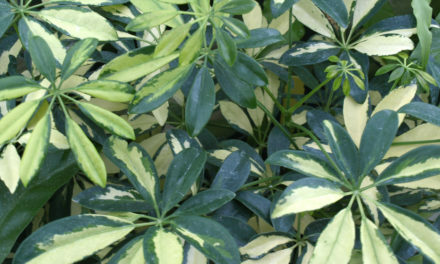 Overfertilization will lead to excessive foliage with little or no flowering. Fertilize every 2 weeks in the spring and weekly in the summer. The plants will not need fertilizer in fall or winter. 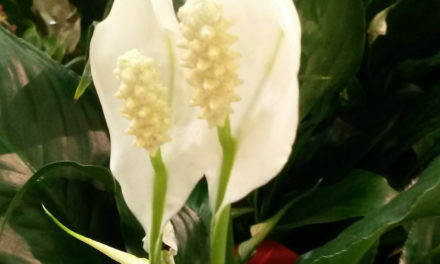 For more information on the care of houseplants refer to HGIC 1450, Indoor Plants-Cleaning, Fertilizing, Containers, & Light Requirements, or HGIC 1459, Indoor Plants – Watering. The easiest way to propagate Bird of Paradise is to divide the underground stems, known as rhizomes. In the early spring, before new growth begins, lift the plant out of the pot and cut the rhizome with a sharp knife so that each division has a fan with roots attached. Plant each division in a small pot, water it, and place in a warm location with bright, indirect light for eight weeks. The plant uses this time to recover and to produce new roots. After eight weeks, move plants to a location with bright sunlight. Flowering should occur in two to three years. Bird of Paradise can also be grown from seed. The offspring, however, will have variable characteristics and can take four to 10 years or more to flower. Seed must be fresh (less than six months old) and, because of the hard seed coat, must be scarified. To do so, scrape the outside of the seed with a file, just enough to break the seed coat. Lightly press the seeds into a moistened seed starting mix, cover with plastic to maintain a high level of humidity, and place in indirect light. Bottom heat of 75 to 90 °F will speed germination and seedlings should emerge in six to 12 weeks. Orange Bird of Paradise: The orange flowering Strelitzia reginae is the plant most often referred to as Bird of Paradise. There is a variety known as ‘Mandelas’s Gold’ that has yellow petals and a blue tongue. White Bird of Paradise: The White Bird of Paradise (Strelitzia alba), is a larger tree form of the Orange Bird of Paradise. It will grow to five to six feet wide and 18 feet tall. The leaves are shaped the same as the Orange Bird of Paradise but are much larger; growing to 18 to 24 inches wide and three to four feet long. The petiole is often four to five feet long. The flower is shaped like the Orange Bird of Paradise, but at 10 to 12 inches, is also significantly larger. The flower is white, with a light blue tongue and sits in a purplish bract. Giant Bird of Paradise: The Giant Bird of Paradise, Strelitzia nicholai, can reach a height of 30 feet, with a trunk capable of reaching 20 feet. The leaves are identical to the White Bird of Paradise except they are attached to a trunk and arranged in a fan pattern on opposite sides of the trunk. Leaf scars are formed on the trunk when leaves fall off, giving the trunk a rough texture. The flowers are white with blue tongues and reddish-brown bracts about 18 inches long but are sometimes difficult to see because they are so high. Juncea Bird of Paradise: Strelitzia reginae var. juncea is a variation of the Orange Bird of Paradise which produces a smaller flower and has leaf blades that do not develop. The leaves arise from the base at the soil line and stay in a round spear-like form. The flowers are produced on a flower stalk like the Orange Bird of Paradise and have the same color but are slightly smaller. 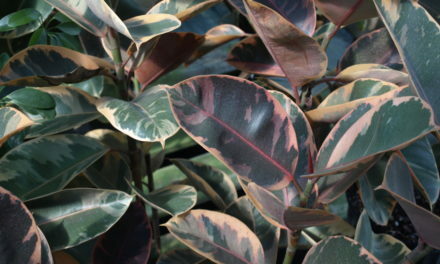 In the home, plant diseases are very rarely a problem. Root rot usually results from a soil mix that does not drain quickly or overly frequent watering. Too much or too little water plus insects and mites are the main problems. Bird of Paradise may be bothered by scales, mealybugs, whiteflies, and aphids. For more information on common houseplant insect refer to HGIC 2252 Common Houseplant Insects & Related Pests.